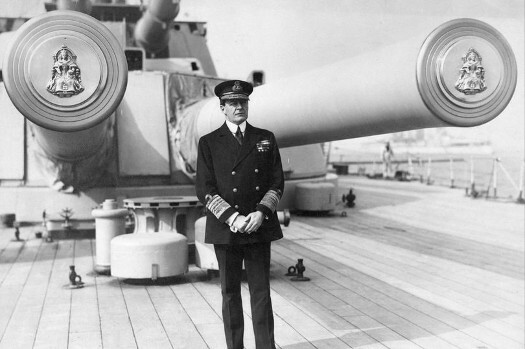 Above, Admiral of the Fleet, the Earl Beatty on the quarterdeck of the battleship HMS Queen Elizabeth (Y turret in the background). Today’s title is of course the famous statement made by Admiral Beatty at the Battle of Jutland. It was made following the loss from magazine explosions - due to the use of cordite as a propellant and NOT poor anti-flash procedures on the part of the crews – of the battlecruisers HMS Indefatigable and HMS Queen Mary that formed part of Beatty’s 1st Battlecruiser Squadron. It should also be remembered that the battlecruiser HMS Lion – on which Beatty had hoisted his flag – was similarly affected with a magazine fire after being hit by a salvo from the German battlecruiser SMS Lützow, but fortunately survived the action. Surviving the conflict, he became 1st Sea Lord and Admiral of the Fleet David Richard Beatty, 1st Earl Beatty GCB, OM, GCVO, DSO, PC. Admiral John Richardson, the USN’s Chief of Naval Operations (Beatty’s opposite number) may well be tempted to make a similar statement following Sunday’s collision of the USS John S. McCain and an oil tanker near Singapore following the earlier collision between the USS Fitzgerald and a container ship near Japan. Both these warships are guided missile destroyers of the Arleigh Burke class. They are equipped with the highly capable AEGIS naval SAM system which has been progressively updated over the years since the early 1980s when it was first introduced into service. The system now is capable of launching and directing SAMs to intercept and destroy ballistic missiles. Such as the type North Korea might launch against the USA and it’s allies. The British Gazette is not going to speculate upon the possible causes of the collisions other than to suggest that Admiral Richardson will see to it that he has a detailed report detailing the problems on his desk ASAP! Whilst on “their side of the pond” the USN appears to have a deficiency in the quality of watch-keeping and collision avoidance procedures, on “our side of the pond”, the UK’s deficiency appears to be the the quality of it’s politicians and their seeming inability to negotiate properly! Evidence of this is clearly shown by the publication of HMG’s latest position paper “Continuity in the availability of goods for the EU and the UK”, published today. It is quite frankly, if printed off, eleven pages of complete garbage! The excellent Doctor Richard North in his blog today publishes a well researched, detailed and excoriating critique of it and HMG’s failings on the Brexit issue.